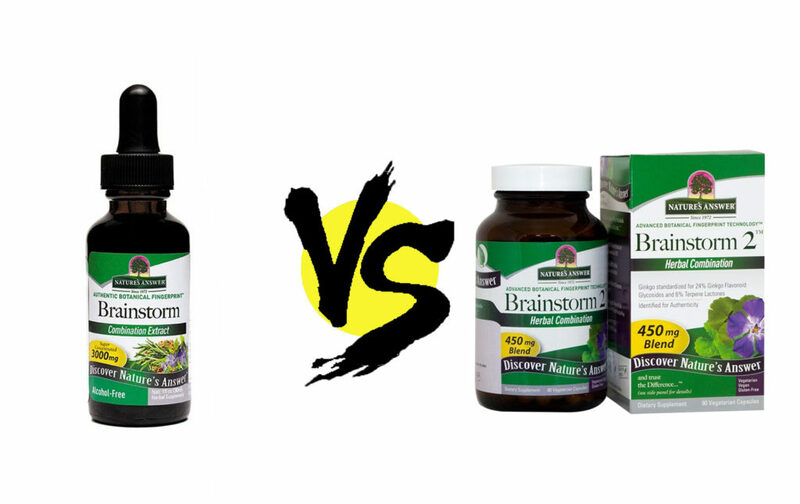 Nature’s Answer Brainstorm vs. Brainstorm 2 reads like a step-one, step-one supplement duo, wherein the second supplement adds to the original. However, in reality, the sequel supplement (Brainstorm 2) is more of a simplification of the original stack, significantly reducing the ingredient count from seven to three. And I’m down for simpler supplements. If you can accomplish more with less, by all means: go for it. This works well for both the manufacturer and the consumer, as you’re likely to get more bang for you buck with a more efficient formula design. But is that even the case here? Does Brainstorm 2’s simpler formula design work better than the original Brainstorm stack? Or did Nature’s Answer remove too many awesome ingredients, creating a weaker brain health supplement with Brainstorm 2? Let’s read the Brainstorm vs. Brainstorm 2 comparison review to find out. 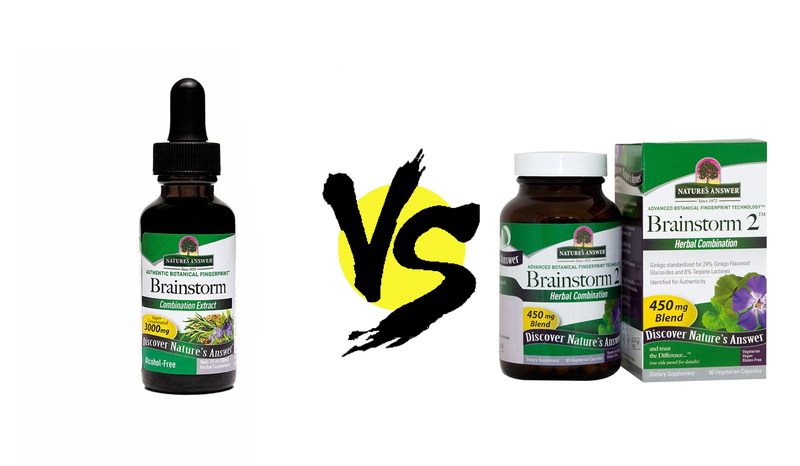 Nature’s Answer Brainstorm or Brainstorm 2: Which is better? 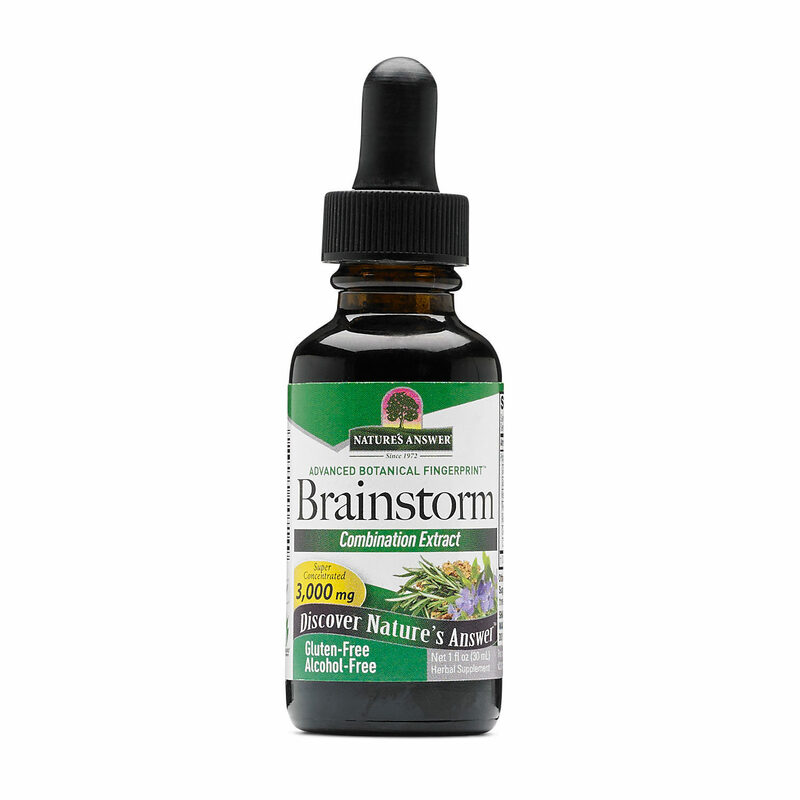 Nature’s Answer Brainstorm Directions: As a dietary supplement, take 1-3 mL (28-84 drops) three (3) times a day in a small amount of water. Nature’s Answer Brainstorm 2 Directions: As a dietary supplement, take one (1) capsule two (2) times a day with food or water. Free Radical Resistance – antioxidant herbal extracts to decrease “aging” oxidative stress. Inflammation Reduction – anti-inflammatory protection, especially for joint pain. Circulation Enhancement – blood-flow boosts for better oxygen circulation. In terms of general nootropic cognitive enhancement, Brainstorm has a few herbal extracts that may work for this, including Ginkgo, Gotu Kola, and Periwinkle (Vinpocetine). Yet, it’s hard to determine the efficacy of these ingredients, given Brainstorm’s use of a proprietary blend, which obscures the individual ingredient dosages. Even so, Brainstorm’s unique liquid design may come with potency benefits not otherwise found in Brainstorm 2’s capsulated formula. Read my in-depth review on Nature’s Answer Brainstorm. Gotu Kola – highly antioxidant herbal adaptogen. Ginkgo Biloba – ancient herb for better circulation. Ashwagandha – anti-stress, anxiolytic adaptogen. Of the three ingredients in this stack, only one isn’t found in the original Brainstorm: Ashwagandha. And this is a pretty awesome addition, as it’s great for bodily stress resistance as well as cognitive wellbeing. I personally enjoy this herb for its anxiolytic (anti-anxiety) calm, which helps put my mind in a Zen-like meditative zone. Having said that, Brainstorm 2’s proprietary blend is concerning, as its overall dosage looks weak for these types of herbs. Not to mention that two of the herbs seem to come in plain powder form (as I’ll discuss below in the “Potency & Quality” section). Read my in-depth review on Nature’s Answer Brainstorm 2. The obvious difference between these supplements: one is liquid, the other capsulated. However, there are several more unique features attributed to each supplement worth noting that I’ll discuss, starting with the original Brainstorm. Hawthorn Berry Extract – Anti-inflammatory, antioxidant — hawthorn berry extract seems to improve cognitive longevity and joint health by reducing oxidative stress and inflammation. Periwinkle Extract – Presumably supplies vinpocetine, the semi-synthetic compound believed to improve cerebral circulation, thereby increasing delivery of oxygen and nutrients to the brain. More on Vinpocetine. Rosemary Extract – May possess anti-inflammatory benefits, protecting the brain and body against harmful inflammation. Southern Prickly Ash Bark Extract – Traditionally used to improve circulation and joint health; however, some compounds from this herb may be toxic. Capsicum frutescens Extract – Often found in weight loss supplements, capsicum may improve metabolic thermogenesis and appetite suppression. Ashwagandha – Some Brainstorm 2 labels display Periwinkle rather than Ashwagandha; however, it seems to be the case that Brainstorm 2 supplies a potentially plain powder form of ashwagandha, an Ayurvedic adaptogen for better mood and stress resistance. More on Ashwagandha. Vegan Capsules – The original Brainstorm comes in liquid form, whereas Brainstorm 2 packs its formula into reasonably clean caps. Way More Servings – The original Brainstorm has 10 servings per bottle. Brainstorm 2 has 90 servings, which is way more servings than most nootropic supplements. I cannot say definitively whether or not Brainstorm‘s liquid design is more potent than Brainstorm 2‘s capsules. However, it seems reasonable to assume that the liquid version has a better absorption rate than the capsule version. Nonetheless, both supplements supply reasonably clean delivery systems, so instead I’ll judge them primarily on the quality of their ingredients. And, really, all ingredients look good, except for two. And these two are both found in Brainstorm 2: Gotu Kola and Ashwagandha. Hold up, guys — I’m having a brainstorm. It could be that the Supplement Facts failed to mention that these herbal ingredients come in extract form. However, as it currently stands, these ingredients seem to be listed as plain powder, which lacks the potency of herbal extracts. I personally find it somewhat hard to believe that Nature’s Answer would downgrade the quality of, say, Gotu Kola, which comes in extract form in the original stack but not Brainstorm 2, but that’s how it looks. Either way, neither supplement poses any significant red flags in terms of potency and quality. If anything, these are two of the more cleaner supplements on the market, given their commitment to all natural, all herbal ingredients. But the original Brainstorm comes across as slightly better quality than Brainstorm 2. While they share the same bottle to bottle price, Brainstorm 2 is substantially cheaper on a “price per serving” basis as compared to the original Brainstorm. However, both supplements are very affordable, especially if you’re frugal with your liquid drips per serving (for Brainstorm 1). Even so, it’s perhaps worth noting that $0.17 is one of the cheapest — if not the cheapest — price per serving amount I’ve come across, at least for a supplement that’s not complete bunko garbage. 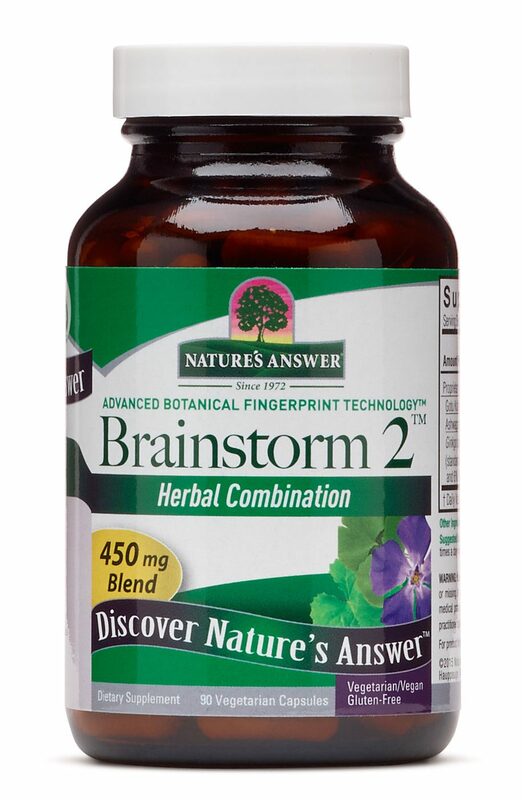 Nature’s Answer Brainstorm is a more diverse, complex herbal extract combination. Nature’s Answer Brainstorm 2 has ashwagandha, and that’s pretty cool. Nature’s Answer Brainstorm 2 has two significant advantages over the original Brainstorm. Significant Advantage #1: ashwagandha, an awesome Ayurvedic adaptogen that helps reduce anxiety for a calmer, more productive mindset. And Significant Advantage #2: the price per serving. Brainstorm 2 is way, way cheaper than the original Brainstorm, and that’s saying a lot, considering how cheap the original Brainstorm is. Had Brainstorm 2 been more of a significant departure from Brainstorm, I’d just recommend buying both and taking both at the same time. These supplements are cheap enough that stacking both Brainstorm and Brainstorm 2 is possible without breaking the bank.